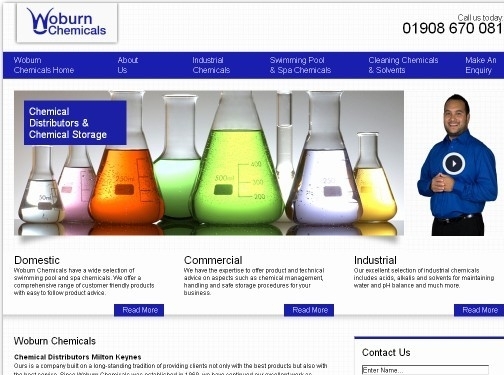 Woburn Chemicals provide Rock Salt, pool and hot tub chemicals, acid and solvents in Milton Keynes, Northampton and the surrounding areas. Serving both domestic and commercial clients, they are on hand to offer advice on handling, storage and more. UK (Milton Keynes) based company - established in 1969 - providing chemicals and solvents including swimming pool chemicals and hot tub chemicals. Website includes details of solutions provided (with video introduction), news section, full company contact details including company registration number.